My son has the habit of wanting food he sees in movies. It's not the first time ( it won't be the last either)I made something by his request that I had no idea how to make. It was Garfield's turn of course so I started to look for a nice Lasagna recipe. 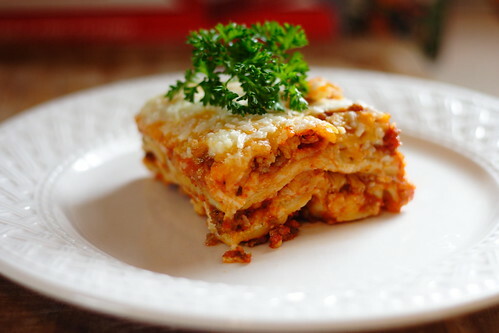 I've taken the original recipe from here : http://allrecipes.com/Recipe/Worlds-Best-Lasagna/Detail.aspx; However, I made couple of adjustments, so I am going to post it here with my corrections. 1. In a big pan stir fry sausage, add onion and garlic over medium heat until well browned. Stir in crushed tomatoes, tomato paste and season with sugar, basil, 1 tablespoon salt, pepper, and 2 tablespoons parsley. * Note: In the original recipe you have to simmer for 1 1/2 hours but I didn't have so much time, that's why I omit the water and tomato sauce, only the crushed tomatoes and paste so you don't need to simmer so long, I would say 30 min is enough, until you make the pasta dough. Stirring occasionally. Now take a note, that I don't cook the lasagna pasta noodles beforehand! 2. Preheat oven to 375 degrees F (190 degrees C). In a large pan combine the ricotta cheese with egg, remaining parsley, and 1/2 teaspoon salt, set aside. 3. 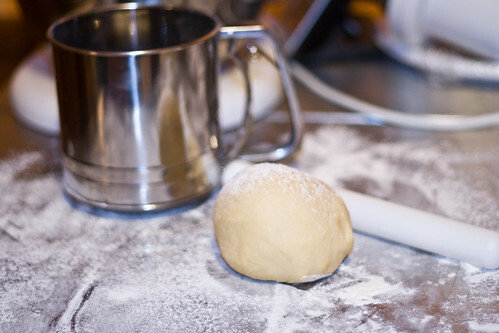 For the pasta, mix the eggs, flour and add the water. 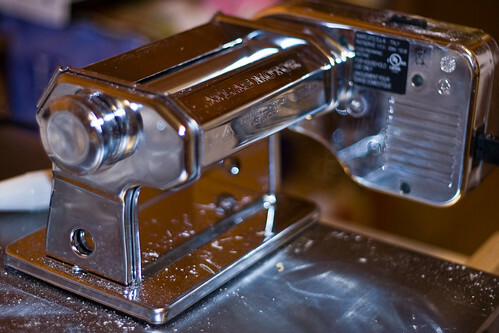 If you feel the dough is too sticky- add flour, if it's too dry, add a little bit of water.Run trough pasta machine, sprinkle with flour and arrange in pan as in recipe. 4. To assemble, spread 1/3 of meat sauce in the bottom of a 9x13 inch baking dish. Arrange the noodles lengthwise so they would cover the tomato sauce. 5. Spread with one half of the ricotta cheese mixture. Top with a third of mozzarella cheese slices. Spoon 1 1/2 cups meat sauce over mozzarella, and sprinkle with 1/4 cup Parmesan cheese. 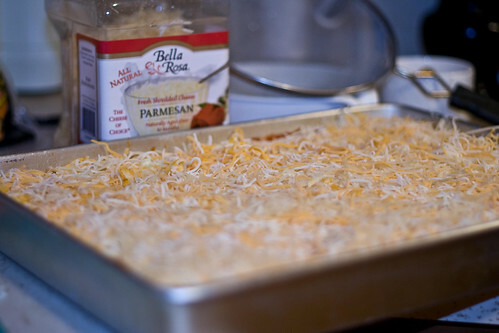 Repeat layers, and top with remaining mozzarella and Parmesan cheese. Cover with foil: to prevent sticking, either spray foil with cooking spray, or make sure the foil does not touch the cheese. 6. Bake in preheated oven for 25 minutes. Remove foil, and bake an additional 25 minutes. Cool for 15 minutes before serving. 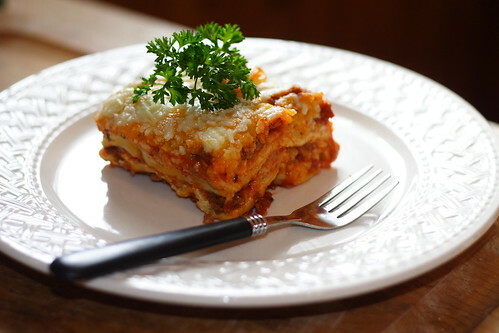 I updated this recipe with new pictures, since the previous time I shot the Lasagna I made, it was too hot when I cut it and it didn't look as good as these pictures! So, what are you waiting for? Grab a fork and "Garfield, the tale of two kitties " movie and dig in!